I struggle with books that are trying to teach the reader something, but have no reference section. 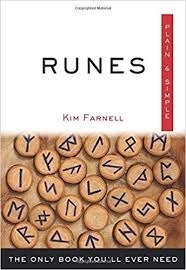 Such is the case with Runes Plain & Simple, by Kim Farnell. The biggest issue I have with this book relative to not having any citations comes at the back in Tables 1 and 2. These are magical correspondence tables, where Farnell has likened Runes to everything from specific gods and goddesses to colors, stones, trees, herbs, flowers, and more. I have no faith in these tables without references and no explanation as to how they were derived. I also struggled with the errors in her historical references. Although I can't go into many, I can pick out a few. The most egregious for me is claiming that Heimdall led the Vanir with Freyja and Freyr in the war against the Aesir. Another one of her claims is that the Vanir beheaded Hoenir, when, in fact, they beheaded Mimir. According to the text, Loki created a set of arrows, not the single dart that he actually created, and gave them to Hödr to kill Baldr. When I began my journey with Runes, three Rune masters told me that I had to understand the culture and mythology from which the Runes came. I spent years studying both and still recognize that there is far more for me to learn that I already know. She does offer a chapter on making your own Runes, which is okay. Some of what she says strikes me as fluff, and some of her "statements" strike me as personal preference more than actually being necessary. She does offer information about different types of wood/trees, which is interesting, but I still struggle with it (and this is me personally), because she doesn't give any citations about the source from which she derived this information. Within this chapter, she also has a section called "Consecrating Your Runes". I would like this section better if her statements were suggestions, because there is no standard practice for how to make your Runes your own. The same holds true with her comments on "activating" your Runes. She claims that you should hold each Rune in your left hand, close your hand around it like a cylinder, and blow into it. What? There is nothing plain or simple about the processes she describes. Although this book is called Plain & Simple, I would not recommend it to beginners. Only someone with some level of expertise could spot the errors and questionable information in this book, and be able to discern the few pieces worth taking away from it.